Chris Sanders began his career in construction in 1981 as an estimator for the International Division of Blount Construction, located in Montgomery, AL. He performed estimates on several projects located in Saudi Arabia, Egypt, Malaysia and the Bahamas. As part of a three person team selected by the company’s chairman, he spent eight weeks in Malaysia performing market research and developing a business plan for Blount to enter the Kuala Lumpur construction market. 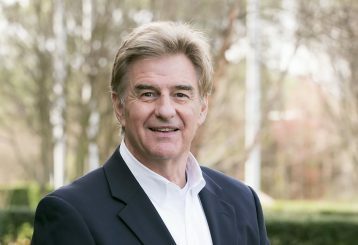 In 1983, Chris joined McDevitt and Street Company as an assistant project manager, relocating to Richmond, VA to work on a twenty-story, $20 million office project located in the city’s downtown area. With McDevitt and Street, Chris was quickly promoted to project manager, senior project manager, and then group manager. He opened an office for McDevitt and Street in Norfolk, where he had total responsibility for the success of the company in Hampton Roads. In 1988, Chris joined Armada Hoffler Construction Company as vice president of operations. He was soon promoted to executive vice president of the company, and was promoted to president in 1996. During his tenure at Armada Hoffler, the construction company’s revenues grew from $25 million to over $180 million per year. Armada Hoffler was ranked as the top 400 contractors in the nation from 1993 through 2000 and became the largest general contractor headquartered in Virginia. In 1999, Chris was selected to be a partner in the Armada Hoffler Development Company, which had $300 million under various phases of development throughout the Southeast. Armada Hoffler Development was a premier developer of office, retail, and some limited hospitality projects, including public/private partnerships. Chris joined Robinson Development Group in the summer of 2000 as Vice President and brings his vast background and expertise in design/construction and development to the Robinson Development team. Chris’ extensive experience includes a successful completion of a wide variety of projects in the areas of hospitality, retail, office facilities, industrial, and healthcare.